L-selectin functions as an important adhesion molecule that mediates tethering and rolling of lymphocytes by binding to high endothelial venule (HEV)-expressed ligands during recirculation. Subsequent lymphocyte arrest and transmigration require activation through binding of HEV-decorated homeostatic chemokines such as secondary lymphoid tissue chemokine (SLC; CCL21) to its counterreceptor, CCR7. Importantly, L-selectin also functions as a signaling molecule. In this study, signaling induced by ligation of L-selectin using mAb or endothelial cell-expressed ligand significantly enhanced the chemotaxis of murine T cells and B cells to SLC but not to other homeostatic chemokines. Consistent with the expression levels of L-selectin in different lymphocyte subsets, L-selectin–mediated enhancement of chemotaxis to SLC was observed for all naive lymphocytes and effector/memory CD8+ T cells, whereas only a subpopulation of effector/memory CD4+ T cells responded. During in vivo mesenteric lymph node migration assays, the absence of L-selectin on lymphocytes significantly attenuated both their ability to migrate out of the HEV and their chemotaxis away from the vessel wall. Notably, ligation of L-selectin and/or CCR7 did not result in increased CCR7 expression levels, internalization, or re-expression. Pharmacologic inhibitor studies showed that L-selectin–mediated enhanced chemotaxis to SLC required intact intracellular kinase function. Furthermore, treatment of lymphocytes with the spleen tyrosine kinase family inhibitor piceatannol reduced their ability to migrate across the HEV in peripheral lymph nodes. Therefore, these results suggest that “cross-talk” in the signaling pathways initiated by L-selectin and CCR7 provides a novel mechanism for functional synergy between these two molecules during lymphocyte migration. Effective recruitment of leukocytes to appropriate tissues is essential for generating efficient immune responses. Lymphocyte migration to the peripheral lymph nodes (PLNs) is mediated by L-selectin, an adhesion molecule that binds to ligands expressed on high endothelial venules (HEVs) and supports the tethering and rolling of free-flowing lymphocytes (1, 2). Subsequent binding of either soluble or endothelial proteoglycan-immobilized homeostatic chemokines such as secondary lymphoid tissue chemokine (SLC; CCL21) with its appropriate receptor CCR7 expressed on lymphocytes results in activation of the β2 integrin LFA-1, leading to firm adhesion via interaction with its ligand ICAM-1 and ultimately to transmigration through the HEV (3). Thus, lymphocyte migration to the PLN involves a complex series of interactions between multiple classes of receptors working in concert. In addition to its adhesive function, L-selectin has also been shown to be involved in intracellular signaling. Specifically, activation via Ab cross-linking of L-selectin on human neutrophils and cell lines has been reported to increase intracellular calcium concentrations (4, 5), superoxide generation (4), and phosphorylation and activation of various signaling proteins (6–8). L-selectin ligation with sulfatide, a sulfated galactocerebroside, enhances expression of TNF-α and IL-8 in human neutrophils (5). Importantly, L-selectin cross-linking by Ab or ligand enhances the β1 and β2 integrin-mediated binding activity of leukocytes (9, 10) and increases leukocyte migration through activated HUVECs (11). Taken together, these studies demonstrate that activation via L-selectin ligation initiates intracellular signaling events that contribute to leukocyte function. In addition to L-selectin, certain homeostatic chemokines and their receptors function to mediate lymphocyte migration to PLNs. One such example is that of the HEV-decorated chemokine SLC and its receptor, CCR7 (12–15). More recently, another homeostatic chemokine ligand–receptor interaction, stromal cell-derived factor-1α (SDF-1α; CXCL12)–CXCR4, has been reported to play a role in memory lymphocyte migration to the PLN (16). Although the most appreciated role during leukocyte migration for signaling through chemokine receptors is regulation of integrin activation, signaling through these receptors can also regulate the activity of other adhesion molecules such as L-selectin. Specifically, after activation of leukocytes with chemoattractants, L-selectin is rapidly phosphorylated on cytoplasmic serine residues in a protein kinase C (PKC)-dependent manner resulting in an increase in ligand binding activity (17, 18). By contrast, whether adhesion molecules play a role in regulating chemokine receptor activity is less understood. Notably, in an Ag-induced migration model, leukocytes from L-selectin–deficient (L-selectin−/−) mice showed a significant reduction in migration away from microvessels in response to platelet-activating factor (PAF) and keratinocyte-derived cytokine (KC), suggesting that L-selectin can influence responses to chemokines (19, 20). Similarly, a severe impairment in leukocyte chemotaxis to some but not all chemokines was observed in transgenic mice expressing a cleavage-resistant form of L-selectin suggesting that its cleavage may influence signaling function during leukocyte recruitment (21). Other in vitro studies have reported that activation of human neutrophil L-selectin by Ab cross-linking in conjunction with IL-8 stimulation enhanced β2 integrin-mediated adhesion and migration across HUVEC monolayers stimulated with IL-1 (11, 22). Furthermore, patients suffering from leukocyte adhesion deficiency syndrome II, caused by defects in selectin ligand synthesis, demonstrated abnormal neutrophil chemotaxis (23). More recently, Ding et al. (24) reported that activation through L-selectin enhanced the expression levels of CXCR4 thus providing a potential explanation for how L-selectin ligation may regulate chemotaxis. However, this L-selectin–dependent CXCR4 upregulation was subsequently shown to be specific only for CD4+ T cells (25). Although these studies support a role for L-selectin in influencing lymphocyte chemotaxis, the specific signaling pathways involved or the degree to which this response is chemokine- and/or cell type-specific remains unknown. The current studies examined the role of L-selectin signaling in regulating lymphocyte migration to SLC. This is an ideal system to examine such an interaction because L-selectin and CCR7 are responsible for virtually all lymphocyte migration across HEVs within PLNs (15, 26). Chemotaxis assays using an activating anti–L-selectin mAb (LAM1-116) or an L-selectin ligand-expressing endothelial cell line demonstrated significant increases in the chemotactic ability of lymphocytes that was subset- and chemokine-specific and inhibited by blocking intracellular kinase pathways. Results from in vivo migration assays also supported a role for L-selectin–mediated signaling in the emigration of lymphocytes out of the HEV. Therefore, these results suggest that activation through L-selectin during lymphocyte recirculation plays an important role in maximizing lymphocyte trafficking across the HEV. C57BL/6 (wild-type) mice were obtained from The Jackson Laboratory (Bar Harbor, ME). L-selectin−/− mice were generated as previously described (27) and were back-crossed onto the C57BL/6 genetic background for more than 10 generations. All mice were bred and housed under specific pathogen-free conditions and screened regularly for pathogens. Mice were 7–12 wk old for all experiments. All studies and procedures were approved by the Animal Care and Use Committee of the University of Wisconsin-Milwaukee. The anti–L-selectin mAbs used in these studies, LAM1-116 and LAM1-101 (both mouse IgG2a), were generated as described previously (9). LAM1-116 and LAM1-101 mAbs were purified from ascites fluid by sodium sulfate precipitation and protein G affinity chromatography (Pierce, Rockford, IL). Purity of the mAb preparations was determined by Coomassie staining of 10% SDS-PAGE gels run under reducing conditions. The purified mAbs were aliquoted and stored at −20°C until use. F(ab′)2 fragments of the LAM1-116 and LAM1-101 mAbs were generated using a F(ab′)2 preparation kit (Pierce) according to the manufacturer’s instructions. To confirm the presence and purity of F(ab′)2 fragments, 10% SDS-PAGE gels were run under reducing conditions, and molecular mass was determined by Coomassie stain. The F(ab′)2 fragments were dialyzed extensively against PBS and stored at −20°C until use. For some experiments, cells were pretreated for 1 h at 37°C with a Gαi inhibitor (1 μg/ml pertussis toxin; List Biologicals, Campbell, CA), a PI3K inhibitor [100 nM wortmannin (Upstate Cell Signaling, Lake Placid, NY) or 50 μM Ly294002 (Promega, Madison, WI)], a PKC inhibitor [200 nM staurosporine (Biomol International, Plymouth Meeting, PA) or 100 nM bisindolylmaleimide (Alexis Biochemicals, San Diego, CA)], a p38 MAPK inhibitor (2 μM SB203580; Santa Cruz Biotechnology, Santa Cruz, CA), a spleen tyrosine kinase (Syk) family inhibitor (10 μM piceatannol; Alexis Biochemicals), or an inhibitor of actin polymerization (20 μM cytochalasin D; Tocris Biochemicals, Ellisville, MO). Control cells were pretreated with an equivalent amount of PBS or vehicle (DMSO) as appropriate. Inhibitors were prepared from 100- or 1000-fold stocks stored at −80°C. Spleen and lymph node cells were isolated from wild-type or L-selectin−/− mice as described previously (9) and filtered through nylon gauze to remove debris. Erythrocytes in the spleen cell suspensions were lysed with an 0.83% ammonium chloride solution, and total cell numbers were enumerated. The chemokines SLC, SDF-1α, and EBV-induced molecule 1 ligand chemokine (ELC) (all from PeproTech, Rocky Hill, NJ) were suspended in RPMI 1640 medium (Invitrogen, Carlsbad, CA) containing 1% BSA at different concentrations (15–1000 ng/ml for both SLC and ELC, and 15–250 ng/ml for SDF-1α). Chemokines (50 μl) were loaded into the lower wells of a chemotaxis assay chamber (Neuro Probe, Gaithersburg, MD). Lymphocytes were treated with 10 μg/ml of either LAM1-116 or LAM1-101 mAb without additional secondary Ab cross-linking. In some experiments, the cells were treated with different concentrations of the mAbs (0.1, 1, 10 μg/ml) or with the F(ab′)2 fragments at a concentration of 20 μg/ml. The cells (0.5 × 105/well) were then added to the upper wells of the chemotaxis assay chamber. The upper wells were separated from the lower wells by a 5-μm pore size polycarbonate membrane (Neuro Probe). The chemotaxis chamber was incubated at 37°C for 2 h in a humidified incubator with 5% CO2. Migrated cells were collected from the lower chamber, pooled, and washed two times with PBS containing 2% normal horse serum (PBS–NHS). The cells were then labeled with FITC-conjugated anti-CD4, PE-conjugated anti-B220, PE/Cy5-conjugated anti-CD44, and Alexa Fluor 647-conjugated anti-CD8 mAbs (all from BD Biosciences, San Jose, CA) at 4°C for 30 min. The labeled cells were washed and analyzed by four-color flow cytometry (FACSCalibur; BD Biosciences). Positive and negative populations of cells were determined using isotype-matched unreactive mAbs (Southern Biotech, Birmingham, AL) as controls for background staining. For cell counts, events were collected at a high flow rate (60 μl/min) for 3 min. For calculating the number of input cells of each subset, cells (0.5 × 105) were directly labeled in parallel with the chemotaxed samples. For each sample, cells with the forward and side light scatter properties of mononuclear cells were analyzed with fluorescence intensity shown on a four-decade log scale. The percentage of input cells that chemotaxed for each subset was calculated by dividing the number of chemotaxed cells by the number of input cells. Spleen cells (1 × 106 cells) were isolated from wild-type mice and allowed to chemotax against SLC (1000 ng/ml) for 2 h as described earlier. The chemotaxed cells were harvested and washed twice with PBS–NHS. Both input and chemotaxed cells were stained with FITC-conjugated LAM1-116 mAb, PE-conjugated anti-CD4, PE/Cy5-conjugated anti-CD44, and Alexa Fluor 647-conjugated anti-CD8 or anti-B220 mAb to determine L-selectin expression levels on different subsets of lymphocytes. Isotype-matched unreactive control Abs were used to determine background staining. The labeled cells were washed twice with PBS and analyzed by four-color flow cytometry as described earlier. Spleen cells (1 × 106) were treated with LAM1-116 or LAM1-101 mAbs (both at 10 μg/ml) in the absence or presence of 1000 ng/ml SLC at 37°C and 5% CO2 for different time periods (15, 30, 60, and 120 min). After incubation, the cells were harvested and washed twice with PBS–NHS. For CCR7 surface labeling, the cells were incubated with purified anti-CD16/CD32 (Fc block; BD Biosciences) for 15 min at 4°C to prevent nonspecific staining. The cells were washed twice, resuspended in PBS containing 0.05% sodium azide, and labeled with PE-conjugated Abs against CD4, CD8, and CD19 (all from BD Biosciences) and allophycocyanin-conjugated mAb against CCR7 (eBioscience, San Diego, CA) at 37°C for 40 min as per the manufacturer’s recommendation. For CXCR4 surface labeling, the cells were treated and labeled as above except that labeling with the allophycocyanin-conjugated anti-CXCR4 mAb (BD Biosciences) was done at 4°C for 30 min. The labeled cells were then washed twice and analyzed by two-color flow cytometry. Positive and negative populations of cells were determined using isotype-matched unreactive Abs as controls for background staining. The fluorescence intensity ratio was determined by dividing the mean fluorescence intensities (MFIs) of CCR7 or CXCR4 labeling after LAM1-116 mAb treatment, with the corresponding MFI obtained after LAM1-101 mAb treatment. This ratio was calculated for each time period. A value of 1.0 indicates equivalent expression of CCR7 or CXCR4 after mAb treatments. EA.hy926 cells were a kind gift from Dr. C.-J. Edgell (Department of Pathology, University of North Carolina, Chapel Hill, NC) (28). EA.hy926–α1,3-fucosyltransferase (EA.hy926–FtVII) cells were generated by stably transfecting EA.hy926 cells with α1,3-fucosyltransferase (FtVII) cDNA as previously described (29). EA.hy926 cells were maintained in complete DMEM medium (DMEM medium supplemented with 2 mM l-glutamine, 100 U/ml penicillin, 100 μg/ml streptomycin, and 10% FBS; all from Invitrogen). EA.hy926–FtVII cells were maintained in complete DMEM containing G-418 (1 mg/ml; Invitrogen). To confirm L-selectin ligand expression, EA.hy926 and EA.hy926–FtVII cells were labeled for the HECA-452 epitope using purified anti-human cutaneous lymphocyte Ag mAb (BD Biosciences) followed by FITC-conjugated anti-mouse Ig secondary Ab (Southern Biotech) as described previously (30). Transendothelial chemotaxis assays were performed using a Transwell chemotaxis assay chamber (Costar Corning) with polycarbonate Transwell filters of 4.3-mm diameter and 5-μm pore size. The Transwell filters were coated with human fibronectin (4.0 μg/well; BD Biosciences) at 37°C for 2 h. EA.hy926 and EA.hy926–FtVII cells (12.5 × 103 in 50 μl) were plated onto the coated filters, 200 μl of complete DMEM medium was added to the lower chamber, and the chamber was incubated at 37°C and 5% CO2 for 72 h. The endothelial monolayers were rinsed once with complete DMEM medium, and isolated spleen cells from wild-type mice (0.5 × 105 cells/well) were added to the upper chamber. The medium in the lower chamber was aspirated and replaced with 200 μl of fresh complete DMEM medium containing varying concentrations of SLC (250–1000 ng/ml), ELC (500–1000 ng/ml), or SDF-1α (125–250 ng/ml). The Transwell chambers were then incubated at 37°C and 5% CO2 for 2 h. The cells that had migrated across the endothelial cell monolayer were recovered from the lower wells, washed twice in PBS, labeled, and analyzed by four-color flow cytometry as described earlier. Additionally, the integrity of the confluent endothelial cell monolayer was assessed using Wright–Giemsa staining of the Transwell filters and phase contrast light microscopy. Single-cell suspensions prepared from the spleens of wild-type and L-selectin−/− donor mice were labeled with CFSE to enable identification after adoptive transfer as described previously (31). Briefly, cells (3 × 106/ml) were incubated in PBS containing 0.25 μM CFSE (Molecular Probes, Eugene, OR) for 30 min at 37°C with gentle mixing every 10 min. After labeling, cells were incubated in RPMI 1640 medium containing 10% FBS for 30 min at 37°C to ensure complete modification of the label. Cells were then washed, counted, and resuspended in PBS for injection. Wild-type and L-selectin−/− CFSE-labeled cells (40 × 106 cells in 400 μl) were injected into the lateral tail vein of individual wild-type recipient mice. After 30 min of migration, recipient mice were perfused free of blood to remove any unbound transferred cells using a Kreb’s buffer solution containing 10 U/ml heparin and 1% sodium nitrite. After perfusion, the mesenteric lymph nodes (MLN; superior mesenteric nodes) were harvested, pooled, embedded in tissue freezing medium (Triangle Biomedical Sciences, Durham, NC), snap frozen in liquid nitrogen, and stored at −20°C until use. To monitor CFSE labeling intensity, an aliquot of the cell suspension used for injection was analyzed by flow cytometry. Both the number and location of transferred CFSE-labeled cells within the MLN were determined by immunofluorescence microscopy (31). Briefly, frozen sections (5 μm) of pooled nodes were sampled across the entire tissue at 50-μm intervals, mounted on poly-l-lysine–coated slides, fixed in acetone, rehydrated in PBS, and incubated with PBS supplemented with 5% normal goat serum and 2% normal horse serum to block nonspecific staining. To identify HEV, sections were first incubated with anti-peripheral node addressin mAb (MECA-79; American Type Culture Collection, Manassas, VA) followed by tetramethyl rhodamine isothiocyanate-conjugated goat anti-rat IgM Abs [F(ab′)2 fragments; Jackson ImmunoResearch Laboratories, West Grove, PA] to detect peripheral node addressin (PNAd) labeling. Sections were blocked in 5% normal rat serum prior to incubation with biotinylated MECA-367 mAb (eBioscience) to detect mucosal addressin cell adhesion molecule-1 (MAdCAM-1) expression. MECA-367 labeling was revealed using Alexa Fluor 350-conjugated avidin (Invitrogen). For some experiments, sections were further labeled with Alexa Fluor 647-conjugated anti-CD4 mAb to identify the transferred CD4+ T cells. Sections were mounted using ProLong Gold (Invitrogen) and analyzed on a Nikon eclipse TE2000-U inverted epifluorescent microscope. Digital monochromatic images were acquired at a constant exposure setting and pseudocolored using MetaVue software (Universal Imaging Corporation, Downingtown, PA). For each section, the basement membranes of the HEV were traced, and all CFSE-labeled cells (total or CD4+ T cells) were scored as either “in” (defined as inside the HEV lumen, wall, or still in contact with the basement membrane) or “out” (defined as being extravascular with no basement membrane contact). For extravascular CFSE-labeled cells, the shortest distance to the nearest HEV (measured at the basement membrane) was recorded as the distance migrated. Eight independent experiments were performed, four using wild-type cells and four using L-selectin−/− cells, with an average of 10 and 35 sections, respectively, being analyzed for each experiment. An average of ∼500 wild-type and ∼200 L-selectin−/−–labeled cells were analyzed for each experiment. Lower numbers of L-selectin−/− cells were analyzed due to their significantly reduced localization to the MLN in short-term migration assays (27, 32). Single-cell suspensions were prepared from the spleens of wild-type donor mice as described earlier. The cells were divided into two groups with one group being labeled with CFSE as described earlier and the other group being labeled with biotin. For biotin labeling, cells were washed in PBS and incubated in sulfo-NHS-LC-biotin (80 μg/ml; Pierce) at a cell concentration of 12.5 × 106 cells/ml for 15 min at room temperature. Immediately after CFSE and biotin labeling, the biotin-labeled cells were treated with piceatannol (10 μM), and the CFSE-labeled cells were treated with vehicle control (DMSO) for 1 h at 37°C. The cells were then washed, counted, and equal numbers (20 × 106) of CFSE- and biotin-labeled cells were mixed and injected into the lateral tail vein of individual wild-type recipient mice. After 30 min of migration, the recipient mice were perfused, and the inguinal and axillary PLNs were harvested, pooled, frozen, and sectioned as described earlier. From 14 to 26 sections were analyzed per experiment. To monitor the biotin and CFSE labeling efficiency and the ratio of CFSE-labeled/biotin-labeled cells injected, an aliquot of the cell suspension used for injection was labeled with PE-conjugated avidin to reveal biotin labeling and analyzed by flow cytometry. Both the number and location of transferred CFSE- and biotin-labeled cells within the PLN were determined by immunofluorescence microscopy. In the first set of experiments (n = 5), frozen sections (5 μm) were labeled with MECA-79 mAb to detect HEV as described earlier. The sections were then labeled with Cy5-conjugated avidin (Southern Biotech) to detect total transferred biotin-labeled cells and analyzed by fluorescence microscopy. In a second set of experiments (n = 3), the migration assays were performed as earlier but only CD4+ T cells were analyzed. Briefly, after labeling to detect HEV, biotin-labeled cells were detected using Alexa Fluor 350-conjugated avidin, and CD4+ T cells were identified using Alexa Fluor 647-conjugated anti-CD4 mAb. The transferred cells present within the PLN were scored as being either “in” or “out” of the HEV with the extravascular cells being further analyzed for distance from the nearest HEV as described earlier. For each experiment examining total lymphocyte migration, an average of >200 CFSE- and biotin-labeled cells were analyzed. For subset migration experiments, between 100 and 200 CD4+ T cells/experiment were analyzed. Alternatively, migration assays were performed as earlier, but single-cell suspensions from the PLN, MLN, and spleen were analyzed by flow cytometry as previously described (27). Briefly, the ratio of piceatannol-treated cells/vehicle-treated control cells present within the tissues after migration (Ro) and within the injected cell mixture (Ri) were calculated. These values were used to generate Ro:Ri ratios from three independent experiments. An Ro:Ri ratio of 1 indicates equivalent migration between treated and control cells. All data are shown as mean values ± SEM unless indicated otherwise. Significant differences between sample means were determined using the Student t test. A p value <0.05 was considered to be statistically significant. Paired t tests were used to determine significant differences within chemotaxis experiments. A role for L-selectin–mediated signaling in lymphocyte chemotaxis to SLC was assessed using the activating LAM1-116 mAb and the control LAM1-101 mAb as previously described (9). To minimize the amount of receptor cross-linking, a secondary Ab was not used in any of the assays. Treatment of bulk wild-type spleen cells with the LAM1-116 mAb resulted in a modest but significant enhancement in chemotaxis to varying concentrations of SLC compared with that of control mAb-treated cells (data not shown). Because there are known differences among lymphocyte subsets in expression levels of L-selectin and responsiveness to SLC, the chemotaxis of specific lymphocyte populations was examined. Subset analysis of chemotaxis after control LAM1-101 mAb treatment showed that 53% of input CD4+ T cells, 55% of input CD8+ T cells, and 7% of input B220+ B cells chemotaxed to 1000 ng/ml SLC (Fig. 1A), which is consistent with previous reports that T cells are more responsive to SLC than B cells (33). Treatment of the cells with the activating LAM1-116 mAb significantly increased chemotaxis with 71, 68, and 12% of input CD4+ T cells, CD8+ T cells, and B220+ B cells, respectively, migrating to 1000 ng/ml SLC. Thus, treatment with the LAM1-116 mAb increased chemotaxis of CD4+ T cells by 34%, CD8+ T cells by 24%, and B cells by 71% to SLC (Fig. 1B). In addition, this enhancement in chemotaxis was observed across the dose-response range of SLC (Fig. 1A). Importantly, treatment with the LAM1-116 mAb in the absence of SLC (−SLC, media control) did not result in any change in baseline chemotaxis of any of the lymphocyte subsets (Fig. 1A). As an additional control, chemotaxis assays were performed using lymphocytes from L-selectin−/− mice. Notably, whereas the chemotaxis of L-selectin−/− CD4+ and CD8+ T cells to SLC was equivalent to that of the corresponding wild-type cells, the chemotaxis of L-selectin−/− B cells was increased by 2.1-fold over that of wild-type B cells (data not shown). Regardless, treatment of L-selectin−/− lymphocytes with the LAM1-116 mAb did not affect chemotaxis to SLC thereby demonstrating that the mAb-induced effect required the expression of L-selectin (Fig. 1B). L-selectin–mediated enhancement in chemotaxis was dose dependent with 10 and 1 μg/ml of LAM1-116 mAb resulting in a similar degree of enhancement to SLC, whereas no enhancement was observed in the presence of 0.1 μg/ml of the mAb (Fig. 1C). There was also no difference in the percent enhancement in chemotaxis of CD4+ or CD8+ T cells when F(ab′)2 fragments of the mAbs were used in place of whole molecules (Fig. 1D). Thus, these results indicate that activation through L-selectin alone does not induce lymphocyte migration but in the presence of SLC can significantly increase the chemotactic response of both T and B cells. Activation through L-selectin enhanced lymphocyte chemotaxis to SLC. Single-cell suspensions of spleen cells were treated with 10 μg/ml of either LAM1-116 or LAM1-101 mAb and allowed to chemotax for 2 h to SLC or media control (−SLC). The chemotaxed cells were labeled to identify lymphocyte subsets and analyzed by flow cytometry. 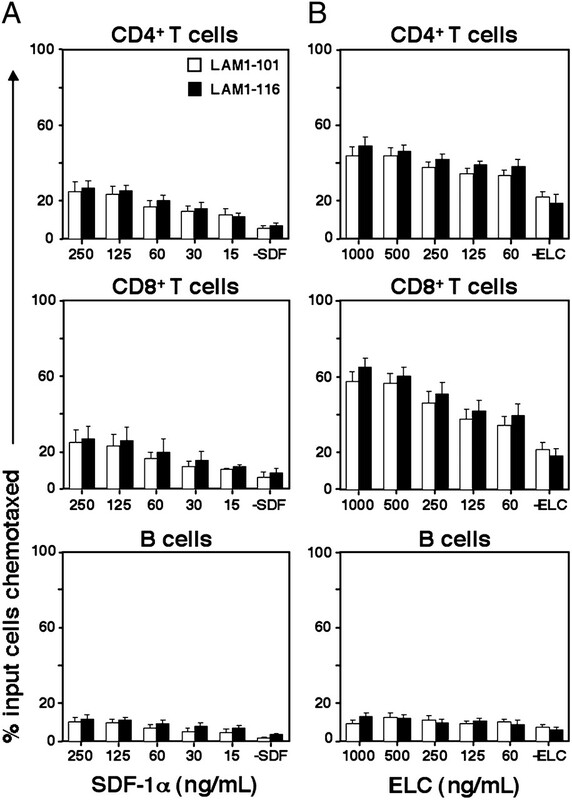 (A) Values represent the mean (±SEM) percentage of CD4+ T cells, CD8+ T cells, and B220+ B cells that chemotaxed to increasing concentrations of SLC (15–1000 ng/ml). *p < 0.05, †p < 0.01 (differences in the mean values between LAM1-116 and LAM1-101 mAb treatments were significant). 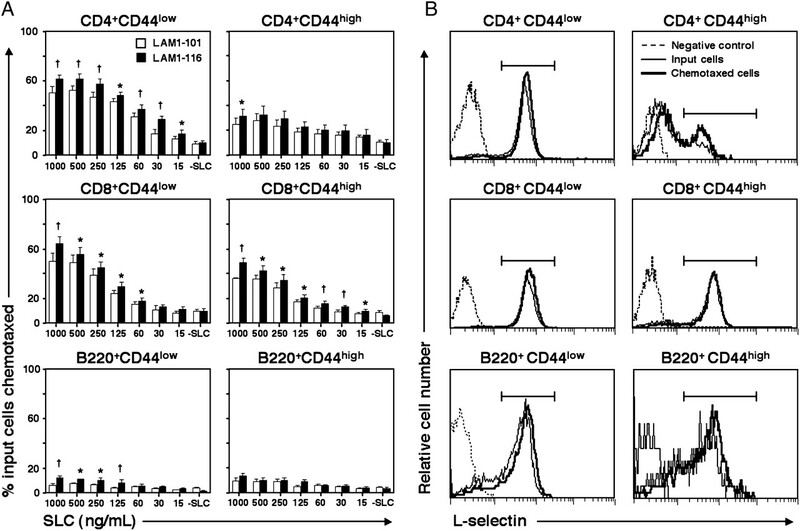 (B) The mean (±SEM) percent enhancement in chemotaxis to SLC after LAM1-116 mAb treatment of wild-type or L-selectin−/− CD4+ T cells, CD8+ T cells, and B220+ B cells is shown. *p < 0.05 (differences between wild-type and L-selectin−/− cells were significant). 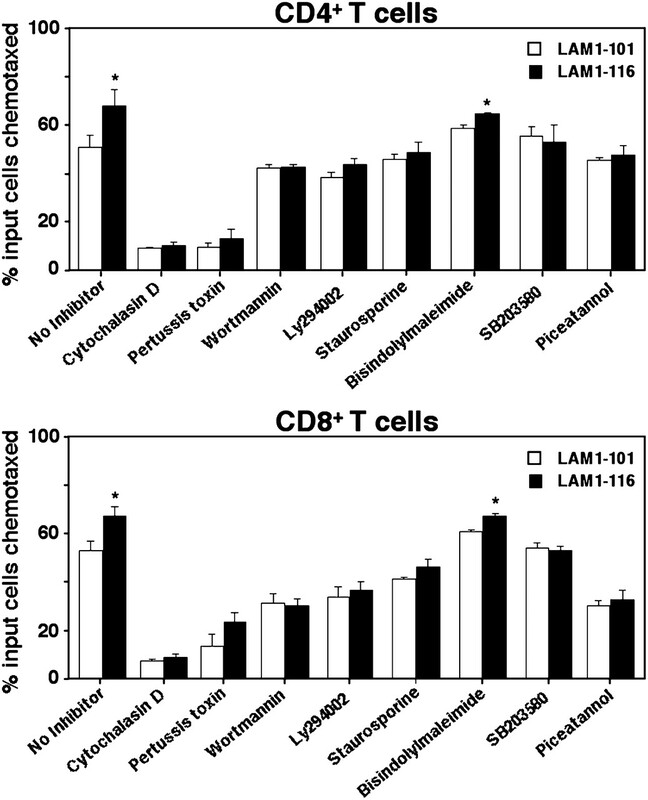 (C) Values represent the mean (±SEM) percent enhancement in chemotaxis of CD4+ T cells and CD8+ T cells mediated by 0.1, 1, and 10 μg/ml concentrations of LAM1-116 mAb. *p < 0.05 (differences between concentrations of mAb were significant). (D) The mean (±SEM) percent enhancement in chemotaxis of CD4+ T cells and CD8+ T cells to SLC after treatment with LAM1-116 mAb [intact or F(ab′)2 fragment] is shown. Results for all graphs were obtained from five independent experiments. To determine if L-selectin–mediated enhancement in chemotaxis was a generalized effect, chemotaxis assays in the presence of other homeostatic chemokines, such as SDF-1α and ELC, were performed. In the presence of the control LAM1-101 mAb, 25% of input CD4+ T cells, 25% of input CD8+ T cells, and 10% of input B220+ B cells chemotaxed to 250 ng/ml SDF-1α (Fig. 2A). Surprisingly, treatment with the activating LAM1-116 mAb had no effect on the chemotaxis of any of the lymphocyte subsets at any dose of SDF-1α examined (Fig. 2A). Activation through L-selectin does not result in enhanced lymphocyte chemotaxis to SDF-1α or ELC. Wild-type spleen cells were treated with 10 μg/ml of either LAM1-116 or LAM1-101 mAb and allowed to chemotax to increasing concentrations of (A) SDF-1α (15–250 ng/ml) or (B) ELC (60–1000 ng/ml). Values indicate the mean (±SEM) percentage of input CD4+ T cells, CD8+ T cells, and B220+ B cells that chemotaxed. Results were obtained from at least three independent experiments. Whether activation through L-selectin could enhance chemotaxis to ELC was also examined. Although SLC and ELC bind to CCR7 with equal affinity and induce similar chemotactic responses, they demonstrate differences in intracellular signaling. Specifically, SLC binding to CCR7 has been reported to induce a relatively weak signaling response compared with that of ELC binding (34). Therefore, because of the inherent differences in signal transduction, it was possible that activation through L-selectin would have differential effects on lymphocyte migration to these chemokines. To test this, chemotaxis assays to varying concentrations of ELC were performed. In the presence of the control LAM1-101 mAb, 44% of input CD4+ T cells, 57% of input CD8+ T cells, and 10% of input B220+ B cells chemotaxed to 1000 ng/ml ELC (Fig. 2B). Similar to SDF-1α, treatment with the activating LAM1-116 mAb had no significant effect on chemotaxis to ELC of any of the lymphocyte populations examined. Therefore, activation through L-selectin did not result in an enhancement of T or B cell chemotaxis to SDF-1α or ELC, demonstrating that L-selectin–mediated enhancement in chemotaxis showed chemokine specificity. Because expression levels of L-selectin vary between naive and effector/memory subsets of T cells (35–38), these populations may respond differently to L-selectin engagement. To assess this, chemotaxis assays were performed in the presence of the activating LAM1-116 or the control LAM1-101 mAb, and the input and chemotaxed cells were labeled with Abs against CD44 to identify the naive (CD44low) and effector/memory (CD44high) phenotype populations as previously described (36). Subset analysis of spleen CD44low cell chemotaxis after LAM1-101 mAb treatment showed that 49% of input CD4+ T cells, 50% of input CD8+ T cells, and 6% of input B220+ B cells chemotaxed to 1000 ng/ml SLC (Fig. 3A). 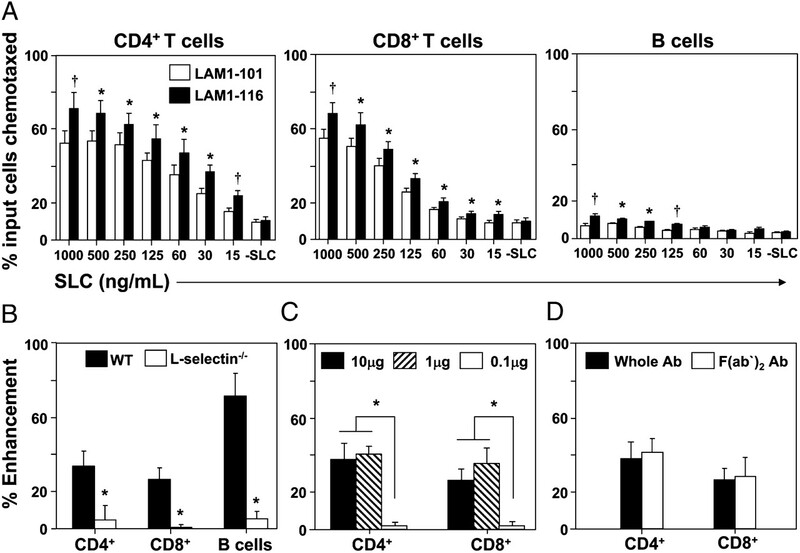 Similar to the results using bulk populations of lymphocytes, treatment with the LAM1-116 mAb resulted in ∼30% increased chemotaxis of CD44low CD4+ and CD8+ T cells and ∼130% increased chemotaxis of CD44low B cells to 1000 ng/ml SLC. CD44high CD8+ T cells also showed significant enhancement in chemotaxis (by 36%, p < 0.01) to 1000 ng/ml SLC in the presence of the LAM1-116 mAb. This enhancement in chemotaxis of the CD44low T and B cells and CD44high CD8+ T cells was observed across the dose-response range of SLC. Notably, increased chemotaxis after treatment with the LAM1-116 mAb was only observed for CD44high CD4+ T cells at the highest concentration of SLC and was not observed for CD44high B cells. Thus, except for CD8+ T cells, the CD44low cell populations were significantly more responsive to LAM1-116 mAb treatment than the CD44high populations. In agreement with these results, ≥90% of all input CD44low lymphocytes and the CD44high population of CD8+ T cells expressed high levels of L-selectin, whereas only ∼40 and ∼65% of input CD44high populations of CD4+ T cells and B220+ B cells, respectively, expressed high levels of L-selectin (Fig. 3B). However, the percentage of cells expressing high levels of L-selectin was increased ∼2-fold in the chemotaxed population of CD4+ CD44high T cells compared with that of the input population (41 ± 4% versus 19 ± 0.5%, respectively; p < 0.02) suggesting that ligation of L-selectin on these cells did increase their chemotaxis to SLC. Notably, the expression level of L-selectin did not decrease on the cells after chemotaxis to SLC (Fig. 3B) or to both L-selectin ligation and SLC (data not shown) indicating that activation via L-selectin and/or SLC in vitro does not induce cleavage of L-selectin on lymphocytes even after 2 h. Therefore, L-selectin–mediated enhancement in chemotaxis to SLC was more dependent on the level of L-selectin expression than on the naive or memory/effector phenotype of the cells. Activation of L-selectin increases the chemotaxis of naive and effector/memory lymphocyte subsets to SLC. Spleen cell suspensions from wild-type mice were treated with 10 μg/ml of either LAM1-116 or LAM1-101 mAb and allowed to chemotax for 2 h to SLC. The chemotaxed cells were labeled for CD4, CD8, B220, and CD44 to identify naive and effector/memory phenotype populations and analyzed using four-color flow cytometry. (A) Values represent the mean (±SEM) percentage of input naive (CD44low) and effector/memory (CD44high) subsets of CD4+ T cells, CD8+ T cells, and B220+ B cells that chemotaxed to varying concentrations of SLC after treatment with either LAM1-116 or LAM1-101 mAb. *p < 0.05, †p < 0.01 (differences in the mean values between LAM1-116 and LAM1-101 mAb treatments were significant). (B) Representative histograms showing L-selectin expression on CD44low and CD44high populations of lymphocytes both before and after chemotaxis to SLC. Histogram gates delineate cells expressing high levels of L-selectin. Results are representative of at least five independent experiments. To approximate more closely the physiologic activation of L-selectin, a second chemotaxis assay system was developed using a human endothelial cell line, EA.hy926, that was transfected with FtVII cDNA (EA.hy926–FtVII). Expression of FtVII in these cells induces expression of functional L-selectin ligand that can be identified using the HECA-452 mAb (Fig. 4A and Refs. 29, 30). Both wild-type EA.hy926 and EA.hy926–FtVII cells were cultured to confluence on fibronectin-coated membranes of the chemotaxis assay chamber prior to performing the chemotaxis assays. Increasing concentrations of SLC were added to the lower chamber, and wild-type lymphocytes were allowed to chemotax across the endothelial cell layer for 2 h. Both CD4+ and CD8+ T cells and B cells showed similar characteristic chemotactic ability to 1000 ng/ml SLC (42, 33, and 13%, respectively) in assays using wild-type EA.hy926 cells (Fig. 4B) as found for chemotaxis across polycarbonate membranes (Fig. 1A). The relatively lower level of chemotaxis observed in the presence of the EA.hy926 cells may reflect slower diffusion of SLC from the lower chamber or additional time required for migration across the endothelial cell monolayer. Regardless, both T and B cells showed specific dose-dependent chemotaxis to SLC in this system. In the presence of EA.hy926–FtVII cells, both CD4+ and CD8+ T cells chemotaxed significantly better (by 31–42%, p < 0.05) than when wild-type EA.hy926 cells were present, whereas B cells showed no difference (Fig. 4B). In contrast to SLC-induced chemotaxis, T cells showed equivalent levels of chemotaxis to either SDF-1α or ELC in the presence or absence of L-selectin ligand (Fig. 4B), similar to the previous results using mAb ligation of L-selectin (Fig. 2). Analysis of CD44low and CD44high populations of cells revealed that CD44low populations of both CD4+ and CD8+ T cells showed significant enhancement (p < 0.05) in chemotaxis in the presence of EA.hy926–FtVII cells compared with that in the presence of wild-type EA.hy926 cells (Fig. 4C). Among CD44high populations, a similar enhancement in chemotaxis was found for CD8+ T cells, with slightly less enhancement observed for CD4+ T cells. For B cells, neither population of cells showed any significant enhancement in chemotaxis in the presence of EA.hy926–FtVII cells. Thus, activation through L-selectin by binding to endothelial-expressed ligand enhanced the chemotaxis of CD4+ and CD8+ T cell populations to SLC. Activation of L-selectin through ligand binding enhances lymphocyte chemotaxis to SLC. Wild-type EA.hy926 and EA.hy926–FtVII cells were grown to confluence on fibronectin-coated membranes of a chemotaxis assay chamber. Wild-type spleen cells were placed in the upper chamber and allowed to chemotax for 2 h to the indicated chemokine. The chemotaxed cells were collected from the lower chamber, labeled to identify lymphocyte subsets, and analyzed by flow cytometry. (A) Representative histograms showing the expression levels of L-selectin ligand (HECA-452 epitope) on EA.hy926 and EA.hy926–FtVII cells (indicated by bold lines). Thin lines represent cell staining with an isotype-matched control Ab. (B) Bar graphs represent mean (±SEM) percentage of input cells that chemotaxed to SLC, SDF-1α, or ELC across either EA.hy926 or EA.hy926–FtVII monolayers. (C) Bar graphs represent the mean (±SEM) percentage of input naive (CD44low) and effector/memory (CD44high) subsets of CD4+ T cells, CD8+ T cells, and B220+ B cells that chemotaxed to SLC across either EA.hy926 or EA.hy926–FtVII monolayers. Results represent those obtained in at least three independent experiments. *p < 0.05 (differences in the mean values between chemotaxis across EA.hy926 or EA.hy926–FtVII cells were significant). To determine whether the above-described effects of L-selectin activation on lymphocyte chemotaxis in vitro also affected the in vivo migration of lymphocytes, adoptive transfer migration assays were performed. The MLN was chosen for the site of emigration because lymphocytes migrating into this tissue through the HEV can use α4β7 integrin in addition to L-selectin (26, 39). The presence of a second adhesion pathway allowed for examining the role of L-selectin in mediating lymphocyte emigration using L-selectin−/− lymphocytes. Importantly, loss of L-selectin does not affect the expression of α4β7 integrin on lymphocytes (26). Lymphocytes from the spleens of wild-type and L-selectin−/− mice were labeled with CFSE, adoptively transferred into individual wild-type mice, and allowed to migrate for 30 min before harvesting the MLNs. Sections of MLN were then labeled for PNAd and MAdCAM-1 to identify HEV, and both the location of the transferred cells (i.e., inside or outside the HEV) and the distance migrated from the HEV were determined. The HEV within the MLN primarily expressed either PNAd alone or along with MAdCAM-1, whereas HEVs expressing only MAdCAM-1 were rarely found (Fig. 5A). Not surprisingly, the majority of the migrating CFSE+ L-selectin−/− cells were found associated with MAdCAM-1 expression on the HEV suggesting use of the α4β7 integrin/MAdCAM-1 pathway for adhesion. By contrast, migrating CFSE+ wild-type lymphocytes were observed associated with all phenotypes of HEV. As previously reported (26, 27), the overall localization of L-selectin−/− lymphocytes in the MLN was significantly reduced compared with that of wild-type cells (Fig. 5A). In addition, whereas more transferred wild-type lymphocytes were present outside of the HEV than inside at this time point, the opposite was found for L-selectin−/− cells (Fig. 5A). In fact, the ratio of cells located inside/outside the HEV was almost 2-fold higher for L-selectin−/− cells compared with that of wild-type cells. Virtually identical results were found if only CD4+ T cells were analyzed (Fig. 5B). When the distances traveled away from the HEV were determined for individual emigrated cells, the highest numbers of wild-type cells were found located from 10 to 30 μm away from the HEV (Fig. 5A). By contrast, the highest numbers of emigrated L-selectin−/− cells were located within 10 μm of the vessel wall. Similarly, when the migration of CD4+ T cells was analyzed, the highest number of wild-type CD4+ T cells were located from 20–40 μm away from the HEV, whereas the highest number of L-selectin−/− CD4+ T cells were located within 10 μm of the HEV (Fig. 5B). 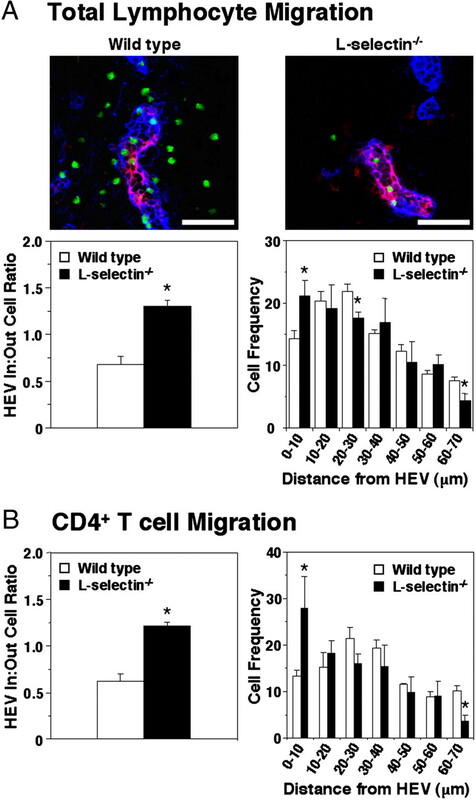 These results suggest that engagement of L-selectin plays a role in both lymphocyte emigration across the HEV wall and subsequent migration within the tissue. Loss of L-selectin reduces lymphocyte egress across the HEV in MLN. Spleen cells from wild-type and L-selectin−/− mice were labeled with CFSE and transferred into wild-type recipient mice. After 30 min of migration, the vasculature was perfused free of blood, and MLNs were harvested and labeled for PNAd and MAdCAM-1 expression. (A) Representative fluorescence micrographs of wild-type (left) and L-selectin−/− (right) cell migration. Digital monochromatic images were pseudocolored and overlayed using imaging software. CFSE-labeled transferred lymphocytes, green; PNAd, blue; MAdCAM-1, red; coexpression of PNAd and MAdCAM-1, magenta. Scale bar, 50 μm. Bar graphs represent the mean (±SEM) ratio of cells located inside/outside of the HEV and the mean (±SEM) frequency of emigrated cells located at 10-μm intervals away from the HEV. (B) Migration experiments were performed as above, but MLN sections were additionally labeled for detection of CD4+ T cells. Values represent the mean (±SEM) ratio of CD4+ T cells located inside/outside of the HEV and the mean (±SEM) frequency of emigrated cells located at 10-μm intervals away from the HEV. Results represent those obtained in eight independent experiments. *p < 0.05 (differences in mean values between wild-type and L-selectin−/− cells were significant). L-selectin–mediated enhancement in chemotaxis to SLC could be a result of an increase in CCR7 expression levels thereby making the cells more responsive to SLC. To examine this, the endogenous expression levels of CCR7 on T and B lymphocyte subsets were examined by flow cytometry. Consistent with previous reports (33), T cells expressed significantly higher levels of CCR7 than those of B cells (Fig. 6A). Specifically, CD4+ T cells expressed the highest level of CCR7, which was more than 2-fold higher than either CD8+ T cells or B cells. Despite their relatively lower expression level, CD8+ T cells still expressed ∼30% higher levels of CCR7 than those of B cells. Additional differences in CCR7 expression levels were observed between CD44low and CD44high populations of cells. Notably, whereas the CD44low population of CD4+ and CD8+ T cells showed significantly higher expression of CCR7 relative to the corresponding CD44high populations, the opposite was found for B cells (Fig. 6A). Furthermore, these results correspond to the observed differences in chemotactic response to SLC among these lymphocyte populations (Figs. 1, 3). Next, the expression level of CCR7 was examined on the various lymphocyte populations after treatment with either the LAM1-116 or LAM1-101 mAbs. After 1 h, cells treated with the LAM1-116 mAb were found to express equivalent levels of CCR7 as those of cells treated with the LAM1-101 mAb (Fig. 6B). Furthermore, examining time points of mAb treatment over a 2-h period failed to detect even transient changes in CCR7 expression (Fig. 6B). Notably, in a different model system, ligation of L-selectin with sulfatides or Ab cross-linking on human lymphocytes was found to increase CXCR4 receptor expression and enhance transmigration to SDF-1α (24). However, in agreement with our previous results where activation through L-selectin did not result in enhanced chemotaxis to SDF-1α (Figs. 2A, 4B), there was no significant difference in CXCR4 expression levels after treatment with the LAM1-116 mAb compared with those after treatment with the LAM1-101 mAb at any time period examined (Fig. 6C). Therefore, activation through L-selectin did not result in a detectable change in CCR7 or CXCR4 expression levels in murine lymphocytes. L-selectin ligation does not affect CCR7 or CXCR4 expression levels. (A) Spleen cells from wild-type mice were labeled with fluorochrome-conjugated Abs against CD4, CD8, CD19, CD44, and CCR7. Expression levels of CCR7 on lymphocyte subsets were determined by flow cytometry. Representative histograms of CCR7 expression on CD4+ T cells, CD8+ T cells, and CD19+ B cells are shown. Bar graphs represent the MFI (±SEM) of CCR7 staining on bulk and on naive (CD44low) and memory/effector (CD44high) phenotype subsets of lymphocytes from three independent experiments. *p < 0.05, †p < 0.01 (differences in CCR7 expression levels were significant). (B) Wild-type spleen cells were treated with 10 μg/ml LAM1-116 or LAM1-101 mAb for different time periods (5, 15, 30, 60, and 120 min), labeled for CD4, CD8, CD19, and CCR7 expression, and analyzed by flow cytometry. Representative histograms show the expression level of CCR7 on CD4+ T cells, CD8+ T cells, and CD19+ B cells after treatment with the LAM1-116 or LAM1-101 mAb for 60 min. 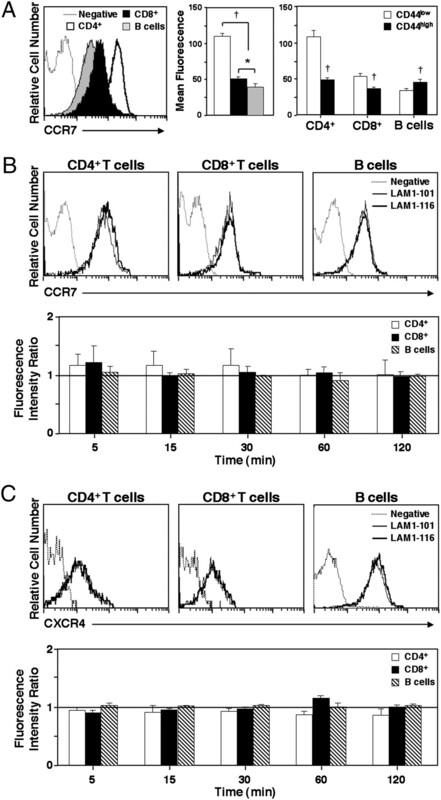 Bar graphs represent the mean (±SEM) fluorescence intensity ratio of CCR7 expression on lymphocyte subsets at the indicated time points after treatment with the LAM1-116 or LAM1-101 mAb from three independent experiments. The fluorescence intensity ratio was determined by dividing the MFI of CCR7 expression after LAM1-116 mAb treatment with the corresponding MFI obtained after LAM1-101 mAb treatment. A value of 1.0 (shown by the solid horizontal line) indicates no difference in CCR7 expression levels between Ab treatments. (C) Representative histograms showing CXCR4 expression on CD4+ T cells, CD8+ T cells, and CD19+ B cells after treatment with the LAM1-116 or LAM1-101 mAb for 60 min. Bar graphs represent the mean (±SEM) fluorescence intensity ratio of CXCR4 expression on lymphocyte subsets after treatment with the LAM1-116 or LAM1-101 mAb calculated as described earlier. Results represent those from three independent experiments. Binding of SLC to CCR7 in human peripheral blood cells, including naive T cells and dendritic cells, has been reported to induce attenuated receptor downregulation with ∼20% of the receptor being internalized (40, 41). Therefore, it is possible that ligation of L-selectin with the LAM1-116 mAb in the presence of SLC affects internalization or recycling of CCR7 thus augmenting its expression and thereby increasing responsiveness to SLC. To address this, lymphocytes were treated with SLC alone or with LAM1-116 or LAM1-101 mAbs for different time periods, and the expression level of CCR7 on T and B cells was determined by flow cytometry. Surprisingly, none of the lymphocyte populations examined showed any significant decrease in CCR7 receptor expression when treated with SLC for different time periods (Table I). In fact, CCR7 expression levels increased over the entire time course regardless of the treatment. Importantly, there was no significant difference in CCR7 expression levels between samples that were treated with SLC alone, SLC and LAM1-116 mAb, or SLC and LAM1-101 mAb at any time point examined. Similar results were also observed when CD44low and CD44high populations of CD4+ T cells, CD8+ T cells, and B cells were analyzed (data not shown). Thus, activation through L-selectin did not affect the internalization or recycling of CCR7. The finding that activation through L-selectin did not result in upregulation of CCR7 expression suggested that intracellular signals generated by L-selectin could synergize with signaling events induced by the binding of SLC to CCR7, leading to the observed increase in lymphocyte chemotaxis. To examine the role of intracellular signaling proteins in L-selectin ligation-mediated enhanced chemotaxis, pharmacologic inhibitors that blocked specific signaling protein functions were used. Inhibitors of Gαi (pertussis toxin), PI3K (wortmannin and Ly294002), PKC (staurosporine and bisindolylmaleimide), MAPK (SB203580), and Syk family kinases (piceatannol) were used. While these inhibitors have been reported to affect chemotaxis to several other chemokines to varying degrees, their role in CCR7–SLC–mediated chemotaxis of lymphocyte subsets is not well established. Inhibition of actin polymerization using cytochalasin D was used as a positive control, and, as expected, treatment eliminated virtually all lymphocyte chemotaxis to SLC (Table II). Similarly, treatment with pertussis toxin dramatically reduced both T (by 52–84%) and B (by 37–59%) cell chemotaxis to SLC (Table II and data not shown). Inhibition of PI3K with either wortmannin or Ly294002 also resulted in significant reductions in chemotaxis of both CD4+ and CD8+ T cells (by 34–65%) although B cells were largely unaffected. By contrast, inhibition of PKC, MAPK, or Syk family kinase activity had only modest effect on T and B cell chemotaxis at lower concentrations of SLC and virtually no effect at high concentration. Thus, these results indicate that lymphocyte chemotaxis to SLC is primarily dependent on Gαi- and PI3K-mediated signaling events. The dependency of L-selectin–mediated enhancement in chemotaxis to SLC on these pathways was next examined. Not unexpectedly, treatment with the LAM1-116 mAb did not result in an increase in chemotaxis of cells treated with cytochalasin D (Fig. 7). Treatment of cells with the LAM1-116 mAb in the presence of pertussis toxin also resulted in little if any increase in chemotaxis over that of the control LAM1-101–treated cells. Treatment with wortmannin or Ly294002, which had pronounced effects on chemotaxis to SLC, reduced the L-selectin–mediated enhancement in chemotaxis by 65–100%. Importantly, L-selectin–mediated enhanced chemotaxis of CD4+ and CD8+ T cells to SLC was significantly reduced (by 63–89%) after treatment with the PKC inhibitors staurosporine and bisindolylmaleimide, with staurosporine being more effective (Fig. 7). Similar results were also observed for the MAPK inhibitor SB203580 and the Syk family kinase inhibitor piceatannol, which resulted in a 63–96% decrease in L-selectin–mediated enhancement in chemotaxis to SLC. Thus, although staurosporine, bisindolylmaleimide, SB203580, and piceatannol had little effect on lymphocyte chemotaxis to SLC alone, treatment with each of these inhibitors virtually eliminated the L-selectin–mediated enhancement in chemotaxis to SLC suggesting that this response involves the PKC, MAPK, and Syk family kinase pathways. L-selectin–mediated enhancement in chemotaxis requires intact intracellular kinase activity. Spleen cells from wild-type mice were pretreated with inhibitors or vehicle control as described in Table II. The cells were washed and allowed to chemotax for 2 h to 1000 ng/ml SLC in the presence of 10 μg/ml LAM1-116 or LAM1-101 mAb. The migrated cells were labeled to detect CD4+ and CD8+ T cells and analyzed by flow cytometry. Values indicate the mean (±SEM) percentage of input CD4+ and CD8+ T cells that chemotaxed. Results were obtained from three to five independent experiments for each treatment. *p < 0.05 (differences in chemotaxis between LAM1-116 and LAM1-101 mAb treatments were significant). To assess whether blockade of intracellular signaling pathways could affect L-selectin–dependent lymphocyte migration in vivo, lymphocytes were treated with piceatannol before being adoptively transferred into wild-type recipient mice. Effects on PLN migration were examined because virtually all lymphocyte migration into this tissue from the blood is dependent on L-selectin and CCR7 function. Piceatannol-treated and vehicle control lymphocytes were differentially labeled (biotin versus CFSE, respectively) and adoptively transferred into the same recipient animal to enable direct comparison of their migration. Piceatannol was used for these studies because it completely eliminated the L-selectin–mediated increase in chemotaxis to SLC in vitro (Fig. 7) without preventing CD4+ or CD8+ T cell migration to SLC alone (Table II). Effects of piceatannol treatment on lymphocyte migration in vivo were first examined using flow cytometry. Specifically, differences in migration of piceatannol-treated and vehicle-treated control cells were determined by comparing the ratio of these cells recovered from the tissues after migration (Ro) with the ratio of these cells that were injected (Ri). After 30 min of migration, no significant differences in the migration of piceatannol-treated and control cells were found for any tissue. Specifically, Ro:Ri ratios of 1.06 ± 0.08, 1.13 ± 0.03, and 1.12 ± 0.05 were obtained from the spleen, PLN, and MLN, respectively (n = 3). Thus, piceatannol treatment did not affect the ability of lymphocytes to initially localize within the PLN. Next, treatment effects on lymphocyte migration within the PLN were examined by immunohistochemistry. Similar to the previous MLN migration assay results, after 30 min of migration, the majority of the lymphocytes were found closely associated with the HEV (Fig. 8A). 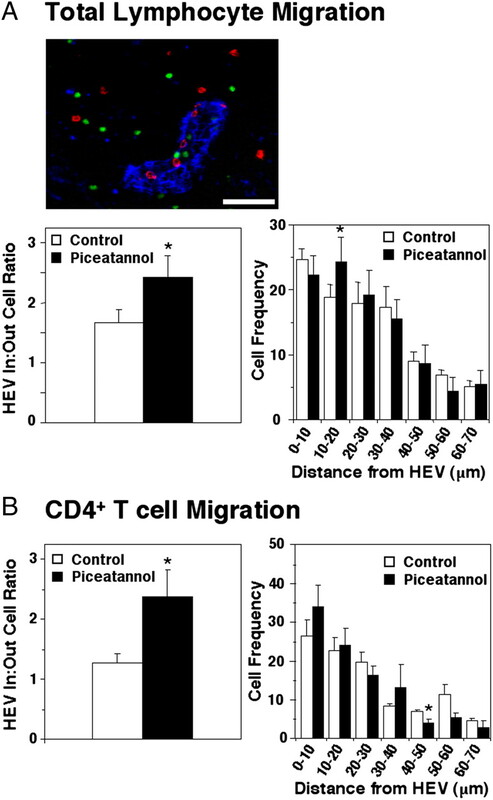 Although both piceatannol-treated and control cells were present inside the HEV and emigrated into the tissue, there was an ∼1.5-fold increase in the ratio of cells located inside/outside of the HEV after piceatannol treatment (Fig. 8A). By contrast, there was little difference between treatment groups in the distance traveled once the cells migrated through the HEV (Fig. 8A). Similar results were found when the migration of CD4+ T cells was examined. Specifically, there was an ∼1.9-fold increase in the HEV inside/outside ratio of piceatannol-treated CD4+ T cells compared with controls but virtually no difference in emigration distance (Fig. 8B). Therefore, these results suggest that activation of Syk family kinases after L-selectin engagement is involved in lymphocyte emigration through the HEV. Treatment with piceatannol inhibits lymphocyte emigration into the PLN. Spleen cells from wild-type mice were labeled with biotin or CFSE prior to treatment with piceatannol or vehicle control, respectively. Equal numbers of biotin- and CFSE-labeled cells were mixed and transferred into wild-type recipient mice and allowed to migrate for 30 min before perfusing the vasculature free of blood and harvesting the PLN. Frozen sections were labeled with MECA-79 mAb and Cy5-conjugated avidin to detect PNAd expression and transferred biotin-labeled cells, respectively. (A) Representative fluorescence micrograph of piceatannol-treated and control cell migration into the PLN processed as in Fig. 5. CFSE-labeled transferred lymphocytes, green; biotin-labeled transferred lymphocytes, red; PNAd, blue. Scale bar, 50 μm. Bar graphs represent the mean (±SEM) ratio of cells located inside/outside of the HEV and the mean (±SEM) frequency of emigrated cells located at 10-μm intervals away from the HEV. (B) Migration experiments were performed as above, but PLN sections were additionally labeled for detection of CD4+ T cells. Values represent the mean (±SEM) ratio of cells located inside/outside of the HEV and the mean (±SEM) frequency of emigrated cells located at 10-μm intervals away from the HEV. *p < 0.05 (difference in mean value for piceatannol-treated and control cells was significant). Results represent those obtained in three to five independent experiments. This study demonstrates that ligation of L-selectin using either an activating mAb or endothelial cell-expressed ligand results in enhanced chemotaxis of lymphocytes to the homeostatic chemokine, SLC. Specifically, treatment with the LAM1-116 mAb increased T cell chemotaxis by ∼30% and B cell chemotaxis by ∼70% relative to the control LAM1-101 mAb (Fig. 1). Notably, activation through L-selectin did not result in either increased chemokinesis of the cells or a generalized increase in chemotactic responses as no enhancement in lymphocyte migration in the absence of SLC (Fig. 1) or in the presence of either ELC or SDF-1α (Fig. 2), respectively, was observed. Among lymphocyte subsets, responsiveness to L-selectin ligation correlated with the expression level of L-selectin. Specifically, naive T cells and B cells as well as memory/effector phenotype CD8+ T cells all expressed high levels of L-selectin, and all showed significant increases in chemotaxis to SLC after LAM1-116 mAb treatment (Fig. 3). By contrast, memory/effector phenotype CD4+ T cells showed heterogeneous expression levels of L-selectin, and only the L-selectinhigh population demonstrated enhanced chemotaxis to SLC after LAM1-116 mAb treatment. In a cell-based model system, activation through L-selectin by binding endothelial-expressed ligand enhanced the chemotaxis of all naive and effector/memory phenotype T cells to SLC but had no effect on B cells (Fig. 4). One potential explanation for the lack of B cell response in the cell-based assay may be a reduced amount of L-selectin ligation compared with that after treatment with the anti–L-selectin mAb. Because B cells have been shown to express significantly lower levels of L-selectin compared with those of T cells (32), ligating a greater number of L-selectin molecules, as would occur with Ab, may be necessary to see a response in B cells. Similar to results of the in vitro assays, during in vivo migration assays in the MLN the absence of L-selectin engagement resulted in significantly decreased egress out of the HEV and more cells being located closer to the vessel wall (Fig. 5). The finding that piceatannol treatment inhibited the migration of lymphocytes across the HEV in the PLN (Fig. 8) argues against this simply being the result of wild-type cells having an advantage of L-selectin–mediated adhesion to the HEV, as L-selectin expression is not altered in those studies. As shown in Fig. 5A and reported previously, PNAd is abundantly expressed on all surfaces of the HEV in lymph nodes. The role of abluminally expressed PNAd is unclear, as L-selectin only supports adhesion under shear flow conditions. The current results suggest that during transmigration across the HEV, the interaction of L-selectin with PNAd on both the luminal and abluminal surfaces may provide sustained signaling that enhances the chemotactic response to SLC, which is also present throughout. One possible mechanism by which L-selectin signaling could mediate enhanced response to SLC would be through increased expression of CCR7. Indeed, this mechanism has been reported to occur with CXCR4 after Ab cross-linking or sulfatide-mediated activation of L-selectin on human lymphocytes (24). However, although differences in CCR7 expression levels were found among lymphocyte subsets and did tend to correlate with responsiveness to SLC, it is unlikely that ligation of L-selectin increased chemotaxis to SLC through this mechanism because no alteration in expression level of CCR7 was observed at any time after treatment with the LAM1-116 mAb (Table I, Fig. 6). Importantly, L-selectin–mediated enhancement in lymphocyte chemotaxis to SLC could be blocked using inhibitors to PKC, MAPK, and Syk family kinases (Fig. 7), suggesting that activation of these pathways after ligation of L-selectin is required. Further support for this idea comes from the finding that blocking Syk family kinase function in lymphocytes during in vivo migration assays significantly reduced their migration across HEV in PLN (Fig. 8). Thus, L-selectin–mediated enhancement in the chemotaxis of T and B lymphocytes to SLC occurs through activation of intracellular kinases. Multiple reports have demonstrated that activation via L-selectin can enhance the adhesive properties of leukocytes (9, 11, 42). However, in the presence of physiologic shear force, the increased activity of integrins resulting from the binding of L-selectin to its ligand alone is unlikely to mediate efficient leukocyte recruitment. This is supported by the observation that lymphocytes from wild-type mice demonstrate normal L-selectin–dependent rolling in HEVs that lack CCR7 ligands but show little conversion to firm adhesion (3). Thus, it is more likely that signals generated from the transient interaction of L-selectin with ligand sensitize chemokine receptors or synergize with signaling pathways activated through receptors such as CCR7, resulting in increased signaling after binding of SLC and enhanced integrin-mediated firm adhesion and migration. In agreement with this idea, several reports have demonstrated that lack of L-selectin expression can significantly attenuate in vivo migratory responses of leukocytes. Specifically, intravital microscopic analysis of Ag-induced leukocyte recruitment showed that leukocytes migrated a shorter distance away from microvessels in the cremaster muscle of L-selectin−/− mice compared with that in the cremaster muscle of wild-type mice (19). In a similar study, the extravascular migration distance of L-selectin−/− leukocytes responding to either PAF or KC was significantly reduced compared with that of wild-type leukocytes (20). The current studies extend the above findings by providing direct evidence that L-selectin ligation can enhance functional responses mediated through certain chemokine–chemokine receptor interactions. Importantly, the enhancement in chemotaxis after L-selectin ligation was observed in the presence of low SLC concentration and during in vivo lymphocyte migration. Therefore, under physiological conditions where both shear force and low or limiting concentrations of SLC are present, the functional cooperation between L-selectin and CCR7 may serve as a mechanism to amplify lymphocyte migration. Previous studies have proposed that binding of L-selectin to its ligand induces intracellular signaling events important to leukocyte migration. Specifically, ligation of L-selectin through Ab cross-linking has been reported to generate intracellular signaling events including enhancement in intracellular Ca2+ levels and increases in MAPK activity that ultimately lead to activation of transcription factors such as NFAT, NF-κB, and AP-1 (6, 43–45). These signaling events ultimately result in increased adhesive functions mediated by β1 and β2 integrins (9, 10). In this study, we assessed whether the in vitro signaling responses induced by activation through L-selectin influenced the chemotactic ability of lymphocytes to respond to homeostatic chemokines. Results showed that abrogating the chemotactic response using inhibitors such as pertussis toxin that block Gαi-mediated signaling dramatically reduced the L-selectin–mediated enhanced migration to SLC. This finding is consistent with the observation that L-selectin–mediated signaling alone does not induce lymphocyte chemotaxis to SLC (Fig. 1). Because SLC binding to CCR7 and ligation of L-selectin have both been reported to activate MAPK (6, 46, 47), it is possible that signaling events from these independent pathways can synergize. In agreement with this hypothesis, Simon and colleagues (48) have reported that inhibition of MAPK activity caused a dramatic reduction in upregulation of β2 integrin after L-selectin cross-linking. In the current study, L-selectin–mediated enhancement in chemotaxis of T cells to SLC was not only dependent on the MAPK pathways but also on upstream signaling proteins such as PI3K. Previous reports have shown that lymphocyte activation by chemoattractants results in phosphorylation of serine residues in the cytoplasmic tail of L-selectin (18). Subsequent studies have reported that PKC and Lck, a member of the Src family of protein tyrosine kinases, associate with L-selectin and phosphorylate its cytoplasmic domain upon activation (49, 50). Consistent with these results, a significant reduction in L-selectin activation-mediated enhancement in chemotaxis to SLC was observed in the presence of the PKC inhibitor staurosporine, suggesting that this response is dependent on the PKC pathway. Furthermore, E-selectin–induced β2 integrin-dependent neutrophil rolling was shown to require activation of Syk (51). Similarly, in the current study inhibition of Syk family kinase activity using piceatannol resulted in reduced L-selectin–mediated enhancement in T cell migration in both in vitro chemotaxis and in vivo migration assays. An attractive target for piceatannol in T cells would be ZAP-70 because it is expressed abundantly in T cells, has been shown to be involved in T cell chemotaxis, and its activity has been reported to show the same dose dependence of inhibition to piceatannol as Syk (52–55). Although both SLC and ELC can bind CCR7 with the same affinity and induce similar chemotactic responses (56), these chemokines mediate different signaling events. Specifically, previous reports have shown that binding of ELC to CCR7 results in robust activation of signaling proteins, such as MAPKs, whereas interaction of SLC with CCR7 results in a blunted signaling response (34). In addition, activation through ELC results in receptor phosphorylation and β arrestin-mediated internalization, whereas binding of CCR7 to SLC results in minimal receptor endocytosis (34, 41). The reason for the presence of two chemokines with differential signaling potentials and redundant roles in lymphocyte migration is not clear. It is possible that signaling through SLC binding to CCR7 requires synergism with signaling events from other pathways to induce an optimal response. Indeed, previous reports have demonstrated that SLC can synergize with other adhesion molecules such as ICAM-1 and VCAM-1 to promote chemokinesis of lymphocytes during in vitro assays (57). Therefore, the finding that L-selectin–mediated enhancement in chemotaxis was specific for SLC and not ELC may be due to the inherent differences in intracellular signaling events triggered by the binding of these two chemokines to CCR7. Coordinated interactions between adhesion molecules have been proposed to mediate lymphocyte entry into the peripheral tissues. In addition, recent evidence shows that homeostatic chemokines can act synergistically to enhance lymphocyte trafficking through the lymphoid organs (58, 59). However, it was unknown whether adhesion molecules can function synergistically with the HEV-decorated chemokines. Recently, PSGL-1 has been shown to interact with SLC or ELC resulting in increased lymphocyte migration to the secondary lymphoid organs (60). In the current study, we provide strong evidence that activation through L-selectin ligation specifically enhances the chemotaxis of lymphocyte subsets to SLC. Given that L-selectin and most if not all chemokine receptors are expressed on the apical microvilli of lymphocytes (61–63), it will be interesting to determine if L-selectin can physically interact with CCR7. The therapeutic blockade of aberrant leukocyte migration at disease sites has met with limited success due in part to the complex and overlapping functions of the many molecules involved. Notably, although SLC is generally considered to be a homeostatic chemokine and thus expressed constitutively, studies have shown that SLC is upregulated in the salivary glands of patients suffering from Sjögren’s syndrome and in the liver during primary sclerosing cholangitis (64, 65). In addition, endothelial cells in the salivary glands of patients with Sjögren’s syndrome have been shown to express L-selectin ligands (66). Therefore, it is possible that L-selectin transduced signals also contribute to leukocyte recruitment at these sites. Recently, a phase II study of an oral Syk inhibitor showed reduced disease activity in rheumatoid arthritis patients demonstrating the possibility of selectively targeting these signaling pathways for therapy (67). Thus, identifying molecular interactions between adhesion molecules and chemokine receptors such as L-selectin and CCR7 may help to better understand the selective and tissue-specific nature of lymphocyte migration during homeostatic recirculation and inflammation. We thank Dr. Thomas F. Tedder for supplying the L-selectin−/− mice and FtVII-transfected EA.hy926 cells used in these studies. We also thank Dr. Cora-Jean Edgell for providing the native EA.hy926 cells. This work was supported in part by grants from the University of Wisconsin-Milwaukee Chancellor’s Office and the University of Wisconsin-Milwaukee Graduate School Research Growth Initiative program. The University of Wisconsin-Milwaukee Graduate School provided support to H.S. through a dissertator fellowship and to J.J.L. through an Advanced Opportunity Program fellowship.
. 1995. The selectins: vascular adhesion molecules. FASEB J. 9: 866–873. 1995. Traffic signals on endothelium for lymphocyte recirculation and leukocyte emigration. Annu. Rev. Physiol. 57: 827–872.
. 2000. The CC chemokine thymus-derived chemotactic agent 4 (TCA-4, secondary lymphoid tissue chemokine, 6Ckine, exodus-2) triggers lymphocyte function-associated antigen 1-mediated arrest of rolling T lymphocytes in peripheral lymph node high endothelial venules. J. Exp. Med. 191: 61–76.
. 1994. Potentiation of the oxidative burst of human neutrophils. A signaling role for L-selectin. J. Biol. Chem. 269: 18485–18491.
. 1994. Sulfatides trigger increase of cytosolic free calcium and enhanced expression of tumor necrosis factor-α and interleukin-8 mRNA in human neutrophils. Evidence for a role of L-selectin as a signaling molecule. J. Biol. Chem. 269: 4021–4026.
. 1995. Signaling functions of L-selectin. Enhancement of tyrosine phosphorylation and activation of MAP kinase. J. Biol. Chem. 270: 15403–15411.
. 1997. L-selectin activates JNK via src-like tyrosine kinases and the small G-protein Rac. Immunology 92: 214–219.
. 1997. Ligation of L-selectin through conserved regions within the lectin domain activates signal transduction pathways and integrin function in human, mouse, and rat leukocytes. J. Immunol. 159: 952–963.
. 1997. Ligation of L-selectin on T lymphocytes activates β1 integrins and promotes adhesion to fibronectin. J. Immunol. 159: 3498–3507.
. 1995. L-selectin (CD62L) cross-linking signals neutrophil adhesive functions via the Mac-1 (CD11b/CD18) β 2-integrin. J. Immunol. 155: 1502–1514.
. 1999. The reduced expression of 6Ckine in the plt mouse results from the deletion of one of two 6Ckine genes. J. Exp. Med. 190: 1183–1188.
. 2004. CXCL12 mediates CCR7-independent homing of central memory cells, but not naive T cells, in peripheral lymph nodes. J. Exp. Med. 199: 1113–1120.
. 1991. Regulation of leukocyte migration by activation of the leukocyte adhesion molecule-1 (LAM-1) selectin. Nature 349: 691–694.
. 1997. Chemoattractant receptor-induced phosphorylation of L-selectin. J. Biol. Chem. 272: 13961–13965.
. 1999. Overlapping roles for L-selectin and P-selectin in antigen-induced immune responses in the microvasculature. J. Immunol. 162: 2709–2716.
. 2000. L-selectin facilitates emigration and extravascular locomotion of leukocytes during acute inflammatory responses in vivo. J. Immunol. 165: 7164–7170.
. 2003. Leukocyte migration is regulated by L-selectin endoproteolytic release. Immunity 19: 713–724.
. 1997. Synergy between L-selectin signaling and chemotactic activation during neutrophil adhesion and transmigration. J. Immunol. 159: 4566–4577.
. 1994. In vivo neutrophil and lymphocyte function studies in a patient with leukocyte adhesion deficiency type II. Blood 84: 1635–1639.
. 2003. L-selectin stimulation enhances functional expression of surface CXCR4 in lymphocytes: implications for cellular activation during adhesion and migration. Blood 101: 4245–4252.
. 2007. Up-regulation of leukocyte CXCR4 expression by sulfatide: an L-selectin-dependent pathway on CD4+ T cells. Eur. J. Immunol. 37: 2949–2960.
. 1998. Efficient lymphocyte migration across high endothelial venules of mouse Peyer’s patches requires overlapping expression of L-selectin and β7 integrin. J. Immunol. 161: 6638–6647.
. 1994. Lymphocyte homing and leukocyte rolling and migration are impaired in L-selectin-deficient mice. Immunity 1: 247–260.
. 1983. Permanent cell line expressing human factor VIII-related antigen established by hybridization. Proc. Natl. Acad. Sci. USA 80: 3734–3737.
. 1999. The cutaneous lymphocyte antigen is an essential component of the L-selectin ligand induced on human vascular endothelial cells. J. Exp. Med. 189: 241–252.
. 2002. Leukocyte rolling velocities and migration are optimized by cooperative L-selectin and intercellular adhesion molecule-1 functions. J. Immunol. 169: 4542–4550.
. 2008. T lymphocyte migration to lymph nodes is maintained during homeostatic proliferation. Microsc. Microanal. 14: 211–224.
. 1998. Intrinsic differences in L-selectin expression levels affect T and B lymphocyte subset-specific recirculation pathways. J. Immunol. 160: 5113–5121.
. 2004. Differential desensitization, receptor phosphorylation, β-arrestin recruitment, and ERK1/2 activation by the two endogenous ligands for the CC chemokine receptor 7. J. Biol. Chem. 279: 23214–23222.
. 1992. Long-term CD4+ memory T cells from the spleen lack MEL-14, the lymph node homing receptor. J. Immunol. 148: 324–331.
. 1996. Lyphocyte migration in L-selectin-deficient mice. Altered subset migration and aging of the immune system. J. Immunol. 157: 1096–1106.
. 1990. Human antigen-specific memory T cells express the homing receptor (LAM-1) necessary for lymphocyte recirculation. Eur. J. Immunol. 20: 1351–1355.
. 1991. Helper T-cell subsets: phenotype, function and the role of lymphokines in regulating their development. Immunol. Rev. 123: 115–144.
. 1998. L-selectin and β7 integrin synergistically mediate lymphocyte migration to mesenteric lymph nodes. Eur. J. Immunol. 28: 3832–3839.
. 2006. Opposite fate of endocytosed CCR7 and its ligands: recycling versus degradation. J. Immunol. 177: 2314–2323.
. 2001. The T cell chemokine receptor CCR7 is internalized on stimulation with ELC, but not with SLC. Eur. J. Immunol. 31: 3291–3297.
. 1996. GlyCAM-1, a physiologic ligand for L-selectin, activates β2 integrins on naive peripheral lymphocytes. J. Exp. Med. 184: 1343–1348.
. 2002. Mechanisms of L-selectin-induced activation of the nuclear factor of activated T lymphocytes (NFAT). Biochem. Biophys. Res. Commun. 291: 237–244.
. 2003. Activation of NF-kappa B transcription factor in human neutrophils by sulphatides and L-selectin cross-linking. FEBS Lett. 536: 241–245.
. 2008. L-selectin ligation-induced CSF-1 gene transcription is regulated by AP-1 in a c-Abl kinase-dependent manner. Hum. Immunol. 69: 501–509.
. 1999. Pharmacological and signaling analysis of human chemokine receptor CCR-7 stably expressed in HEK-293 cells: high-affinity binding of recombinant ligands MIP-3beta and SLC stimulates multiple signaling cascades. Biochem. Biophys. Res. Commun. 263: 685–690.
. 2003. CCR7-mediated physiological lymphocyte homing involves activation of a tyrosine kinase pathway. Blood 101: 38–44.
. 2000. L-selectin signaling of neutrophil adhesion and degranulation involves p38 mitogen-activated protein kinase. J. Biol. Chem. 275: 15876–15884.
. 2004. The interaction of protein kinase C isozymes α, ι, and θ with the cytoplasmic domain of L-selectin is modulated by phosphorylation of the receptor. J. Biol. Chem. 279: 34472–34480.
. 2008. Critical role of Lck in L-selectin signaling induced by sulfatides engagement. J. Leukoc. Biol. 84: 1192–1201.
. 2007. Spleen tyrosine kinase Syk is necessary for E-selectin-induced alpha(L)beta(2) integrin-mediated rolling on intercellular adhesion molecule-1. Immunity 26: 773–783.
. 1998. ZAP-70 tyrosine kinase is required for LFA-1-dependent T cell migration. J. Cell Biol. 142: 1371–1379.
. 2001. Cutting edge: T cell migration regulated by CXCR4 chemokine receptor signaling to ZAP-70 tyrosine kinase. J. Immunol. 167: 1857–1861.
. 2002. Signaling through ZAP-70 is required for CXCL12-mediated T-cell transendothelial migration. Blood 99: 3111–3118.
. 2007. CXCR3-mediated T-cell chemotaxis involves ZAP-70 and is regulated by signalling through the T-cell receptor. Immunology 120: 467–485.
. 1998. The chemokine SLC is expressed in T cell areas of lymph nodes and mucosal lymphoid tissues and attracts activated T cells via CCR7. Eur. J. Immunol. 28: 2025–2034.
. 2006. Homeostatic lymphoid chemokines synergize with adhesion ligands to trigger T and B lymphocyte chemokinesis. J. Immunol. 177: 2340–2348.
. 2009. CXC chemokine ligand 12 promotes CCR7-dependent naive T cell trafficking to lymph nodes and Peyer’s patches. J. Immunol. 182: 1287–1295.
. 2005. A rich chemokine environment strongly enhances leukocyte migration and activities. Blood 105: 3405–3412.
. 2007. Interaction of the selectin ligand PSGL-1 with chemokines CCL21 and CCL19 facilitates efficient homing of T cells to secondary lymphoid organs. Nat. Immunol. 8: 532–539.
. 2001. CCR5, CXCR4, and CD4 are clustered and closely apposed on microvilli of human macrophages and T cells. J. Virol. 75: 3779–3790.
. 1993. Detection and spatial distribution of the beta 2 integrin (Mac-1) and L-selectin (LECAM-1) adherence receptors on human neutrophils by high-resolution field emission SEM. J. Histochem. Cytochem. 41: 327–333.
. 2002. Leukocyte extravasation: chemokine transport and presentation by the endothelium. Blood 100: 3853–3860.
. 2001. “Lymphoid” chemokine messenger RNA expression by epithelial cells in the chronic inflammatory lesion of the salivary glands of Sjögren’s syndrome patients: possible participation in lymphoid structure formation. Arthritis Rheum. 44: 408–418.
. 2002. Hepatic expression of secondary lymphoid chemokine (CCL21) promotes the development of portal-associated lymphoid tissue in chronic inflammatory liver disease. Am. J. Pathol. 160: 1445–1455.
. 1996. Expression of selectins (CD62 E,L,P) and cellular adhesion molecules in primary Sjögren’s syndrome: questions to immunoregulation. Clin. Immunol. Immunopathol. 80: 55–66.
. 2010. An oral spleen tyrosine kinase (Syk) inhibitor for rheumatoid arthritis. N. Engl. J. Med. 363: 1303–1312.